There is a wide variety of devices designed to quantify the physical activity on the market. We all know the Nike Fuelband, the SmartBand SWR10 from Sony, or the LG Touch Lifeband. They all have one thing in common: they are focused mainly on fitness. All of them can count steps, measure distances and altitude changes, and each brand and model has different applications for some other sports, like biking or swimming. Some smartwatches, especially the Kreyos Meteor, include all kinds of sensors to monitor more movements, adapting the device for a better tracking of sports like golf. 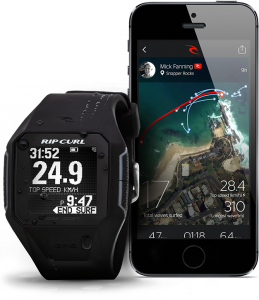 However, the Rip Curl Search GPS SmartWatch is the first smart watch designed for surfing. It monitors all the relevant information of a surf session, as the speed that we have in each wave, the total distance traveled, and the route we have followed. The information is synchronized with our mobile app or with the Rip Curl’s website, where we can see all the information in the form of statistics and graphics. 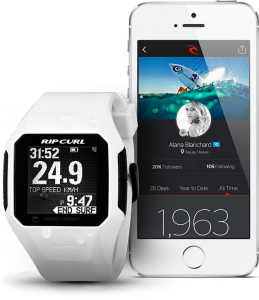 Rip Curl is a famous brand in the world of surf watches, providing information about the sunrise, the phases of the moon, and the tides, in more than 1300 spots all over the world. However, with this smart watch, the company goes a step further, and in addition to store useful information before we start our surf session, it also provides a lot of useful information about our physical activity during the session. The watch will be available soon, but the price is not yet known. In principle, it will be compatible with iOS devices via Bluetooth. All surfers interested can register on Rip Curl Search Watch website to know the last news.